NEW YORK (CNS) — The story of the Gospels unfolds through the eyes of the mother of God in “Mary of Nazareth” (Ignatius Press Films), a beautiful, often moving depiction of the life of Mary from her childhood through the passion and resurrection of her son. Italian director Giacomo Campiotti (2002’s “Doctor Zhivago”) has produced a handsome and respectful film, with a gifted international cast and some luminous cinematography shot in Tunisia. The script, by Francesco Arlanch, more or less follows the biblical account, with a few intriguing departures, inspired by apocryphal writings, that heighten the drama. For example, we are told that King Herod (Andrea Giordana) heard a prophesy of a girl who would one day bring forth a savior, prompting him to terrorize Judea, in a precursor to the slaughter of the innocents. Mary’s parents, Ann (Antonella Attili) and Joachim (Roberto Citran), hide their young daughter, keeping her safe. The Nativity (unfortunately, Joseph misses the birth, as he leaves the cave to fetch water) is beautifully rendered. Mary possesses a strong, almost psychic bond with her young son, aware when he is hurt or in danger, and experiencing visions of his future Passion in her mind. 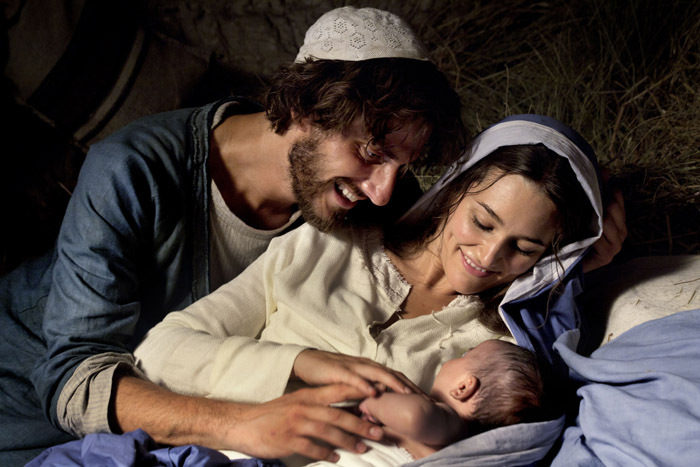 Once Jesus (Andreas Pietschmann) begins his public ministry (“He couldn’t stay and be a carpenter forever,” Joseph says), Mary is always present, strong and compassionate, helping when she can. But when she asks him for assistance with the wine at Cana, she later worries she was impulsive, forcing Jesus to act before he was ready. Mary not only shares her son’s ministry, but also his pain. Every blow during the scourging is felt by Mary, as is the slow agony of Crucifixion. She literally crawls up the hill of Calvary on her hands and knees to be near her dying son. The depictions of the slaughter of the innocents and the Passion are graphic, even harrowing, which pre-teens might find upsetting. “Mary of Nazareth” is available for sponsored screenings in theaters, and is expected to be released on DVD later this year. For more information, visit www.maryfilm.com. The film contains several scenes of bloody violence and death. The Catholic News Service classification is A-II — adults and adolescents. Not rated by the Motion Picture Association of America.